The main GIS laboratory is located in the South Engineering Research Center (SERC). The SERC was opened in January 2012, the first building entirely for the College of Engineering since H.M. Comer Hall was completed in 1960. The SERC provides additional instructional and research laboratories for several engineering disciplines from the College of Engineering, encouraging multidisciplinary collaboration. SERC Room 3000 is dedicated solely to the GIS Research Group, where many of our undergraduate students perform research. SERC Room 2024 is home to graduate student offices across various departments, where many of our graduate students work. Bevill 0027 is a newly acquired laboratory workspace for our growing staff. All of the GIS Research Group laboratory spaces are locked and accessible through pre-approved key access. The laboratory provides GIS processing and computing capabilities with a range of software and hardware necessary for high-end GIS research. Check out the video below to see incredible footage from the Inspire 1 Quadcopter flying around Bryce Hospital on campus. Using our Leica ScanStation laser scanner, we have the ability to scan real world objects and create a 3-dimensional representation of those objects. Leveraging laser scanning registration software and 3-dimensional reconstruction software packages, we have the ability to scale the object down and print the object. This project has the potential to create product prototypes, visualize complicated scenes in new and powerful ways, and add physical objects to product explanations. An example of this project in action is the Bryce Hospital statue. The statue stood on the Bryce campus which is adjacent to The University of Alabama for over 100 years. When the university took control of the land, the statue was taken down for restoration. We scanned the statue and created a 3-dimensional model which we then printed at 1/10th the scale of the life-size model. 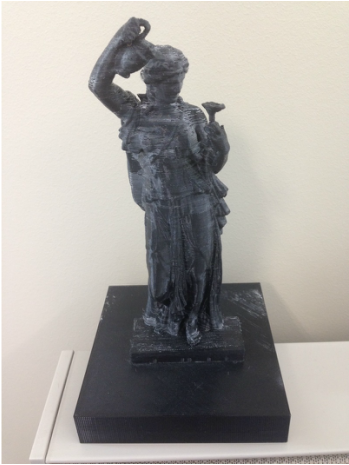 This virtual model is stored in our archives, and if the real statue gets damaged we can 3D print replacement parts which can be used to repair the statue.